Organizing your clothing can be very helpful, no matter what the reason. 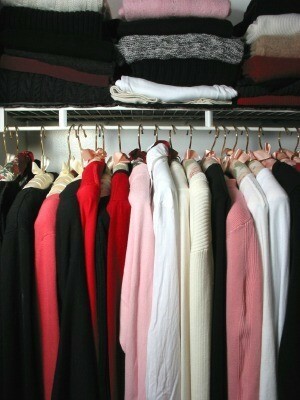 This is a guide about organizing clothes. This is an idea I've been slowly implementing. If you have 30 tops (many women have 150 or more including tees, tanks, sweaters, sweatshirts, long sleeved, short sleeved, dress blouses, cotton blouses, etc. ), you could wear each top ONLY ONCE A MONTH for an entire year! A hundred years ago, even 30 tops would have seemed an extravagance few could afford and fewer could probably fit in those non-existent clothes closets. But now we Americans, at least according to the less is more Europeans, are swimming in a sea of mediocre at best clothing. Imagine for a moment you cull the absolute best 30 tops from all the closets, drawers, laundry baskets, and to be folded piles of laundry all around your house and you toss anything that isn't in the top 30. Now, each day, you will be wearing your "best" stuff and need not fear running into your boss, old boyfriend, new client, or new friend from your yoga class looking schleppy. You'll be dressed your best each and every day. Now let's take it a step further. Let's say that old group of 100 tops was bought new for about $20 each. That is $2000 in clothing, most of which will not wear well, stay stylish for long, or be worth more than $1.00 at a garage sale within a year or less. If instead, you were starting from scratch (which you won't have to if you're like most over clothed Americans) and buying only 30 tops for the whole year. That same $2000 will buy 30 tops around $66 each. J Crew has good quality clothing and you could currently buy a "featherweight cashmere short-sleeve sweater" on sale for $59.99 (Reg. $148). This is a FAR better option than buying 3 cheaply made $20 tops. The cashmere will stay in style and last likely four or more years at an annual cost of $15 or less. If you repeat this thinking with all your clothing, buying good quality clothing on sale, you will soon build an impressive, high quality wardrobe for less or no more than you spend now and will up your style quotient exponentially. Put your clothes together on Sunday afternoon for the whole week. I iron and hang everything together. I put outfit, jewelry and underwear on the hanger with socks/hose and shoes directly underneath. This saves about 30 minutes every morning with trying to get out the door to work. Try it your life will be a little less stress. I have been doing this for over 30 years and have many followers. Just be sure and check the weather every Sunday. I usually clean my closet and chest of drawers out about twice a year. I take out all the things I can no longer wear and older things. I have a yard sale with these things plus other odds and ends collected around the house that are no longer wanted. After the yard sale, I carry all of the things left over to Helping Hands (a local charity). They use some of it for victims of fire, tornadoes, and the homeless and needy, the rest goes in their store for sale to the public. It helps out Helping Hands, and it lets me get rid of unwanted clothing and things. I enjoy wearing my separates in various combinations. Often when I've put together an outfit I really enjoy, I can't remember the top, bottom, jewelry, shoes, belt, hair accessories, etc. that made the whole ensemble a hit. How do I organize my clothes if I don't have any dressers? I have a huge room with nothing but a TV stand and a TV. I also have a radio which is sitting on the floor. I have a big closet that's already full of clothes on hangers and clothes also on the top racks in the closet. How can I organize my room in a cute way? I wish ThriftyFun could give my room a makeover. With a little craft work, you can make a useful solution. Get many sturdy cardboard boxes which are all the same size (tip: go to walmart after midnight, and they will gladly give you good boxes that they don't need). Close them from one side, and seal it shut, then rip off all the lids from the other side, so u have boxes that are open, and lidless. now. for the craft part. place the boxes sideways, so that the open part is facing you. place them next to each other, in rows of 4 or 5, and then place the next set of boxes over it, a little off center, so that the weight is supported with the "beams" from the lower boxes. glue them together. keep on putting more boxes on top, in the same fashion up to 4 or 5 levels. You will have a cubby-hole storage structure. You can store your things in these, heavy things at the bottom and lighter things as you go to the upper levels. If you paint the entire structure with spray paint, in and out, it will look nice and elegant, too. When we were newly married, this is one of the things we did to store our clothes and other things. A Google search shows that there is a Freecycle group in Jacksonville. You should join the online group and simply ask for a dresser. If you have no luck the first time, wait a week or two and ask again. People are getting rid of a lot of stuff with spring cleaning and feel good about finding a new home for their things with someone who can use it. Good Luck. I'd also support the FreeCycle suggestion. FreeCycle.org will list links to groups in your area. I started out giving away things I couldn't use anymore, then asked for something I needed. If you can do that, all the better. Remember, though, FreeCycle's rules specify you have to be able to pick up anything you request, so be prepared to do that. Also be prepared for stiff competition and imperfect or "fixer-upper" items. Another inexpensive option for getting a dresser is garage sales, thrift stores, etc. Our local Catholic HS had their annual Klutter Kloset sale just when I needed a new dresser one year. I couldn't afford their sticker price, so made a reasonable offer (half the sticker price) and the dresser was mine! Does anybody have any ideas on what to do with clothes that you have worn, but feel like you could wear them again before washing? These items always get flung over a chair in my household. I don't really want to hang them back up or put them back in the drawers, but I'm not sure of a good place to put them so things still look tidy. Any suggestions? I have an eight peg coat rack that hangs on the wall in my bathroom. The clothes get hung there if they can be worn again. It looks like lattice with wooden pegs. But seriously, it depends on the article of clothing. If we're going to rewear something, we'll probably do it pretty soon, so we just fold it and put it on the dresser. That way it doesn't end up forgotten with our other clothes without being washed. Hi there StellBell! My hint only works for hanging items (not folded items) but I turn the hook of the hanger of the "gently worn" clothes opposite of the "freshly laundered" clothes in our closets. This helps remind me that an article of clothing can be worn at least once more before washing and the memory of just taking it off the hanger that morning reminds me to throw it in the laundry basket after wearing that day! Good luck! You can also get a bar that hangs on the door, but sticks out a good foot or two. You could get some red hangers and use them only for items that have been worn, and hang them on the door on a bar. That way they can air. You could even give them a shot of Febreeze if they need it. I wear an item and want to wear it again, I slip a rubber band on the top hook of the hanger, however I always hang and air the clothing item first! I think it best that clothes are hung up somewhere other than the closet in order to air. I have a hook on the outside of my closet door and I hand mine there. Personally I wouldn't hang them back in the closet. It won't hurt but they need to air out. I use one of those standing coat racks. It works wonderfully for that! I hang my clothes on a hanger inside out and hang it by the window to air out. Then I know for sure it has one more use before it goes down the laundry chute. My family (husband, myself, 4 year old son and a 10 year old daughter) moved into a 3 bedroom, 2 bath home with my mother to save money for a house. However, I need ideas on how to organize our shoes and clothes using only two closets and minimal space. We put ours in a plastic hanging shoe thingee with pockets for individual shoes. If it's where it will show, place it inside the closet door making sure the door is closed all the time when not in use to help the door frame support the added weight. We do this for quick access. A friend of mine puts hers back into the original box they came in and stores them neatly on the closet floor in rows up, and across. If you have and haven't used the storage space under the beds, you could make some kind of low platform on sliders, or use a large plastic rubbermaid type box with top on to keep dust off them. You could just keep the current season's clothes out and available and the others seasons packed in those bags that you can roll up and from which you can extract the air. Also available locally, check WalMart, K-Mart and Target. How about an open cubbyholed set of boxes that you can use as a giant shelving unit across a wall. 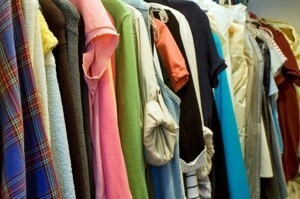 The clothing for the next day needs to be selected in advance and hung on hangers to have the wrinkles fall out. Just make sure that this collection of boxes is solid and won't fall over on anyone (like a little kid climbing on it). You can buy the shoe holders that hang on doors at Wal-Mart. Or store them underneath your bed. I do my shoes on the side of the bed I sleep on and my boyfriend's on the side that he sleeps on. They also sell those laundry racks at Wal-Mart & Dollar stores that have wheels and a pole on them to hang clothes on. Or you can buy those under-the bed Rubbermade storage containers to store out of season clothes! Instead of using up space in drawers for bras, I found a slacks hanger and later moved up to the multiple slacks hanger where you can hang 5-6 pairs of slacks on one hanger. The wooden single slacks hanger works great because you can undo the wooden dowl and slip off the bra on the far back without taking them all off of the hanger. The multiple hanger you just clasp the clasps around the rod and they hang well. Easy to see and pick out the one you need. In my closet I have my purses on a shelf lined up horizontally and my shoes on a hanging rack behind my closet door. And with clothes, try rolling them. I have two dressers and you can fit twice the clothes in your dressers when you roll your clothes. Organize them like t-shirts in one drawer tank tops in another etc. Also those little kid cubbies are great to put makeup and hair stuff in. Put the cubbies in front of a mirror and your all set. I use my suit cases to store seasonal clothes in. If i need the suitcase for traveling I put the folded clothes in a large garbage bag where the remain until I get home! Works great! I did a search on how to fold clothes. You'd be surprised how much space I saved by changing the way I folded my clothes! This is a guide about organizing your bedroom closet. 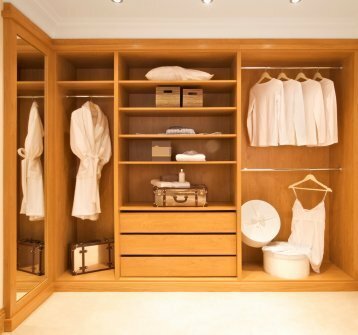 Closets are known for gathering junk, often being the go to place for things when a surprise guest comes. Having an organized closet is a constant reminder to what clothes you have, which can save you money by not buying unneeded clothes.